Established in South Africa in 2000, The Meat Co Steakhouse opened in London in 2008 at the Southern Terrace end at Westfield’s Shepherds Bush. It is an expansive space, with the ground floor operating as a bar, and upstairs as an enormous dining area decorated in warm dark tones. The headline act is the Connoisseurs’ Choice of Cuts, which includes chateaubriand, wagyu and kangaroo. There are also super-aged steaks, and these meats, sourced from both the UK and the US are firstly basted in a secret traditional recipe before being flame grilled to order. Also on the menu is a variety of chicken, seafood and veggie options. And paramount to its success is that The Meat Co prides itself on offering an approved Halal menu. I first visited The Meat Co a couple of years ago and had a very respectable and enjoyable experience. This time around it was just as enjoyable. Moreover the desserts had stepped up another level and were even better than I remembered. We tried a variety of starters including the salt and pepper calamari (£8), peri-peri prawns (£10.50) and chicken wings (£8.75). 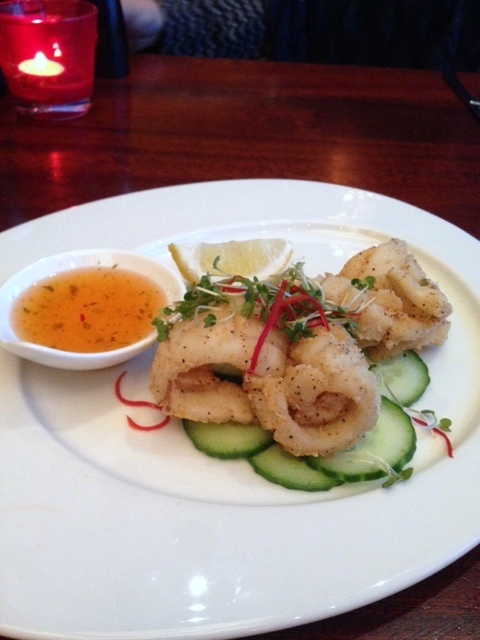 The calamari was excellent, being tender and coated with a light, crispy and well-seasoned batter. 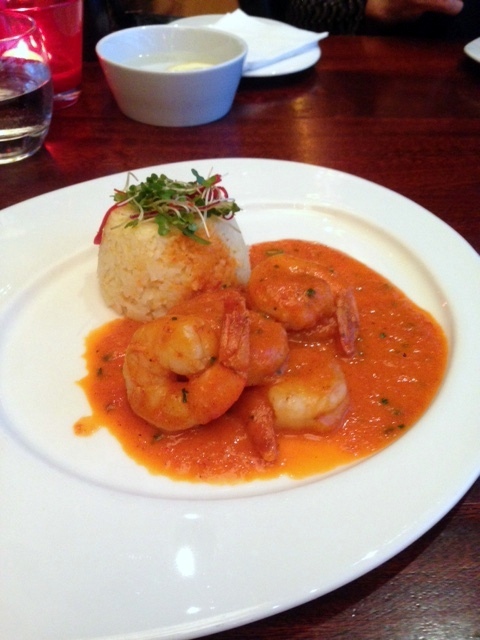 The prawns in a peri-peri sauce had been pan-fried with shallots and garlic and were firm in texture with a good flavour. The peri-peri sauce itself was decent, if a little bit too strong in flavour from the use of peppers. The chicken wings were solid and had been coated with a sweet, sticky sauce that was ever so moreish. Chef Michael Nadra has an impressive list of restaurants under his belt including time as Sous chef at Chez Bruce and La Trompette and stages at The Square in Mayfair and The Glasshouse in Kew. 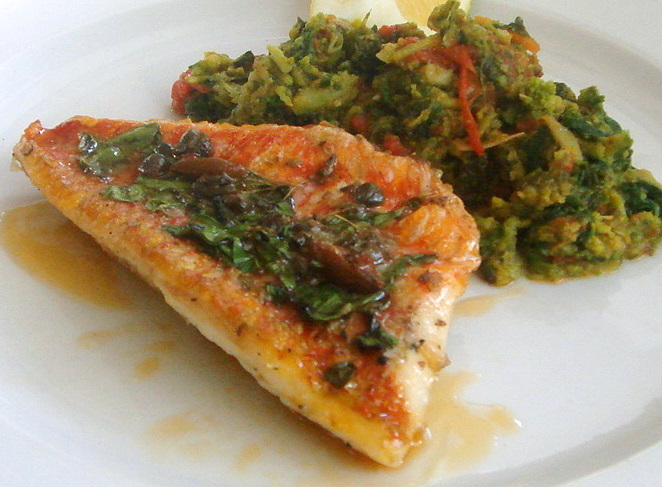 His first solo venture was a restaurant called Fish Hook in Chiswick which he opened in 2005. Many readers may not recall Fish Hook, but I remember it to be a quaint little restaurant serving accomplished and wonderfully tasty seafood at reasonable prices. With Restaurant Michael Nadra, Chef Nadra continues to delivery really good quality contemporary cooking at reasonable prices in a relaxed and comfortable setting. For dinner, two courses from a prix fix menu are only priced at £30, and three courses are £36. There are two branches of Restaurant Michael Nadra, one in Chiswick, and the other in Primrose Hill. We found ourselves in the Chiswick branch, a comfortable looking restaurant with dark furnishings and waiting staff dressed in black. We started with a sautéed foie gras (+£3) which was beautifully cooked and oozed with a lovely fattiness. 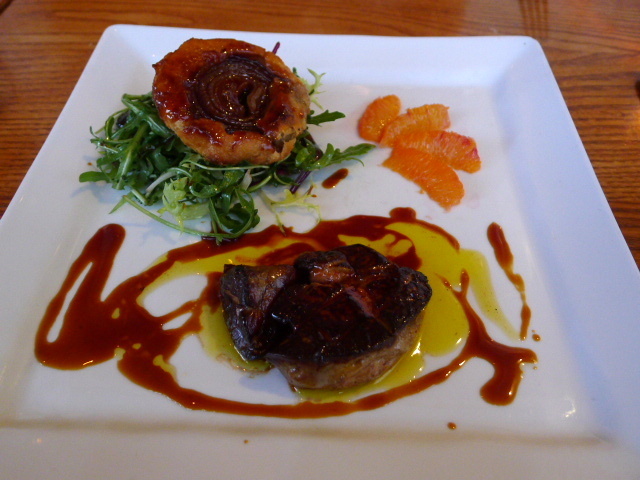 But the foie gras lacked for a touch of seasoning which contrasted sharply with the blood orange salad which was very over seasoned. An accompanying caramelised red onion tart was impressive for the perfect caramelisation of the onion and the lusciously flaky and buttery puff pastry that surrounded the onion. An accomplished madeira jus worked well with the foie gras. Seasoning aside, this was an extremely well executed dish. Wahaca, the Mexican street eat restaurant chain started by the 2005 Masterchef winner Thomasina Miers, is one of my favourite cheap eats in London. 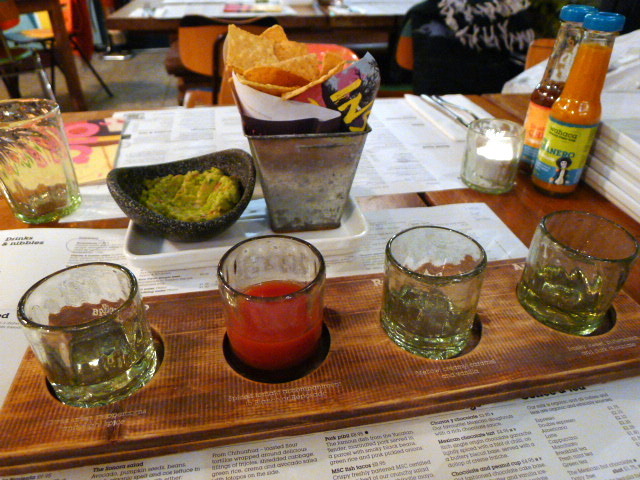 Wahaca do some key things really well. Their vibe is relaxed and chilled, the ingredients they use are always fresh, and the dishes are refreshingly appetising. You can also expect a general level of consistency in the food no matter which branch you visit as most of the prep is done in the centralised Wahaca kitchen on Charlotte Street before being distributed to the various Wahaca branches. And best of all the food is really reasonably priced. And did I mention the yummy cocktails? We visited the Wahaca at the very smart Westfield White City, perfectly located for a bite to eat after a spot of shopping. We kicked of with some drinks, heading straight for the interesting Tequila Experience (£10.65) which consisted of three separate tequila shots. First up was the cold sharpness of the Calle 23 Blanco which served as an aperitif washed down with sangrita. Next was the Reposado, a tequila with a light and woody flourish that we slowly savoured during the meal. To finish, we had the Añejo Calle 23, an aged tequila which was smooth and mellow with a nice finish. We also really adored the refreshing and not too sweet passionfruit margarita (£6.25). Tapas Revolution is the brainchild of Spanish Chef Omar Allibhoy who noteable includes Ferran Adria’s El Bulli on his CV. With a desire to spread the word on tapas in the UK, Tapas Revolution was borne – both a cookbook and a restaurant chain which sees two branches to its name, one in Westfield’s Shepherd’s Bush, and the other in Bluewater. 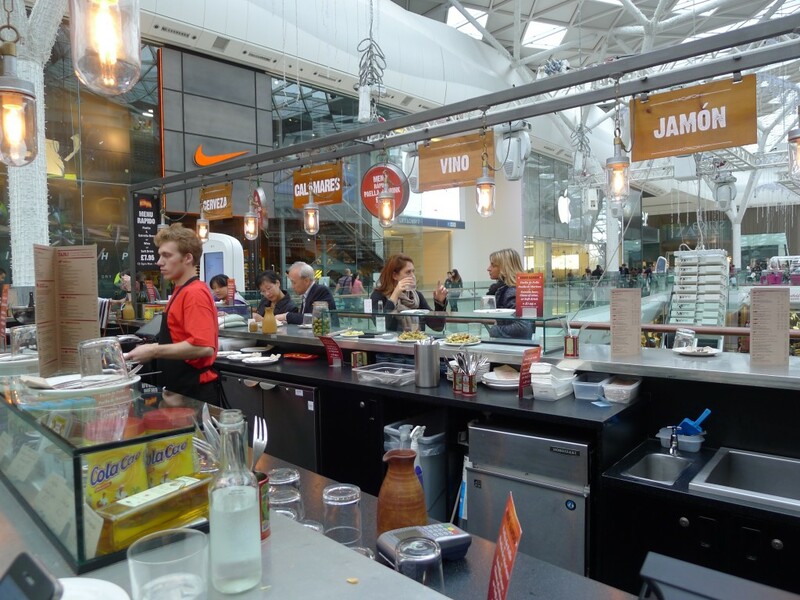 You can find Tapas Revolution in the centre of the mall surrounded by shops rather than the Southern Terrace ‘restaurant strip’ at Westfield’s. And rather than being a sit-in restaurant, the outlet has been designed as an uncovered eatery where diners perch on bar stools around a rectangular bar area. The highlight of our meal was the hams. Jamón ibérico de bellota Guijuelo (£8.95), an Acorn-fed Iberian ham voted the 2013 IFFA best ham in the world, was excellent. Full of flavour, it was also a generous portion for the price. 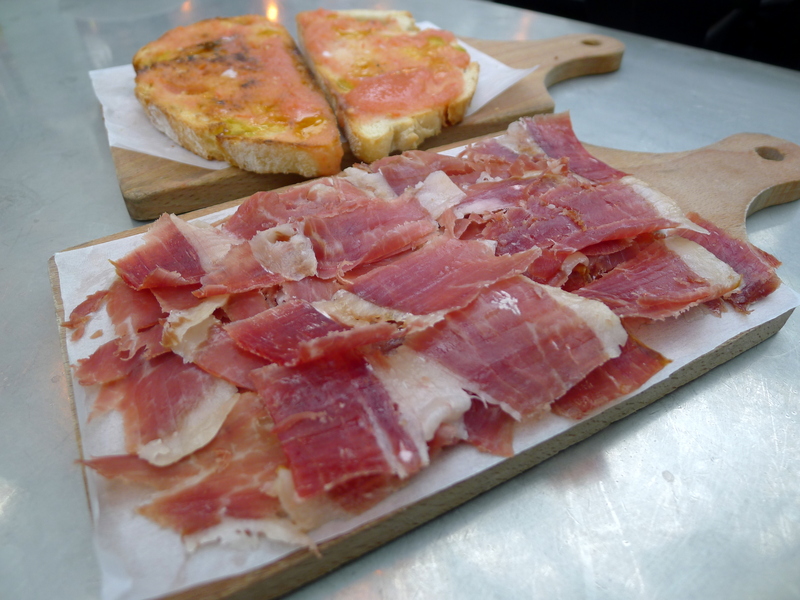 Also tasty was the 18 month cured jamón serrano del consorcio (£5.25), which was again very reasonably priced for both the quality and quantity. Le Vacherin in Chiswick might bear the name of a famous French cheese, but it’s more than just a cheese restaurant. It’s a cosy, intimate French Bistro with a touch of the Parisian. The man behind it is Malcolm John, who also runs another well known French bistro in Croydon, Le Cassoulet. Le Vacherin plays host to a number of gala dinners during the year to celebrate all manner of things, including the start of the vacherin season. But it was the annual truffle gala dinner to mark the beginning of the truffle season that we attended last week. The gala truffle dinner consisted of a six course truffle tasting menu with matching wines for £85. Truffles in every course – what could be better? Truffles are heavily prized, and I adore the fragrant, pungent aroma, and the nutty, fungal taste. 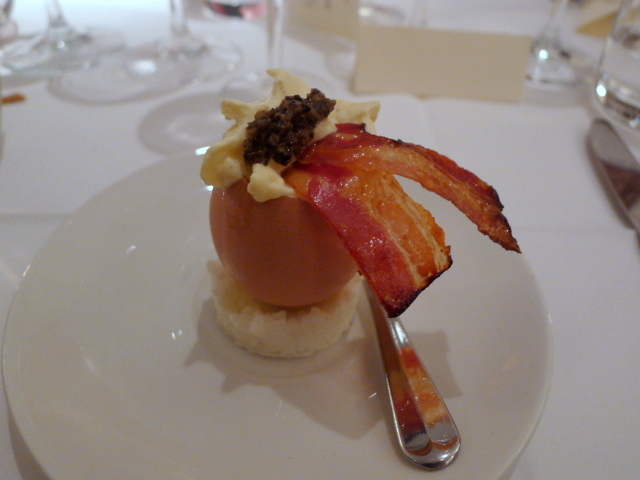 To kick things off was an amuse of scrambled hen’s egg with perigord truffle and Alsace bacon (matched with NV Crémant de Bourgogne Rosé). 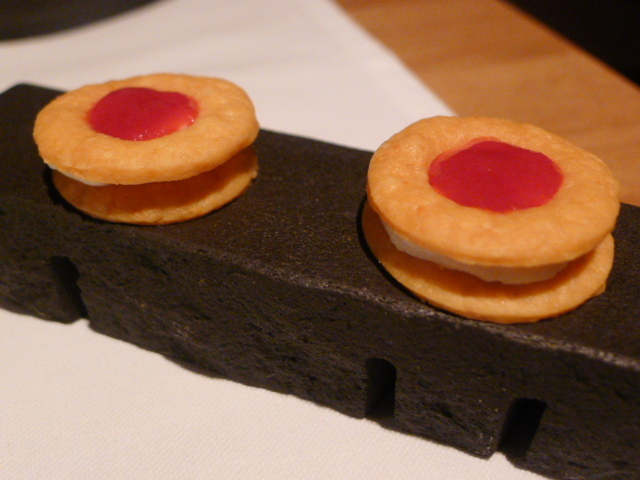 Essentially, an egg mousse with compressed air injected into it, it was clever, but perhaps a touch too airy. But the wonderful intensity of flavour coming through from the crispy bacon was fantastic, and the truffle shavings were lovely. As pointed out to me by some readers, Sushi Hiro which has now closed, use to be the Japanese restaurant favoured by chefs Heston Blumenthal and Anthony Demetre of Arbutus. But just a few steps down the road is another Japanese gem, Kiraku. The story goes that Heston only stumbled across Sushi Hiro because he was trying to get a table at Kiraku after being sent there by the head of his experimental kitchen, Kyle Connaughton. Finding the latter full, he wandered down to Sushi Hiro instead. 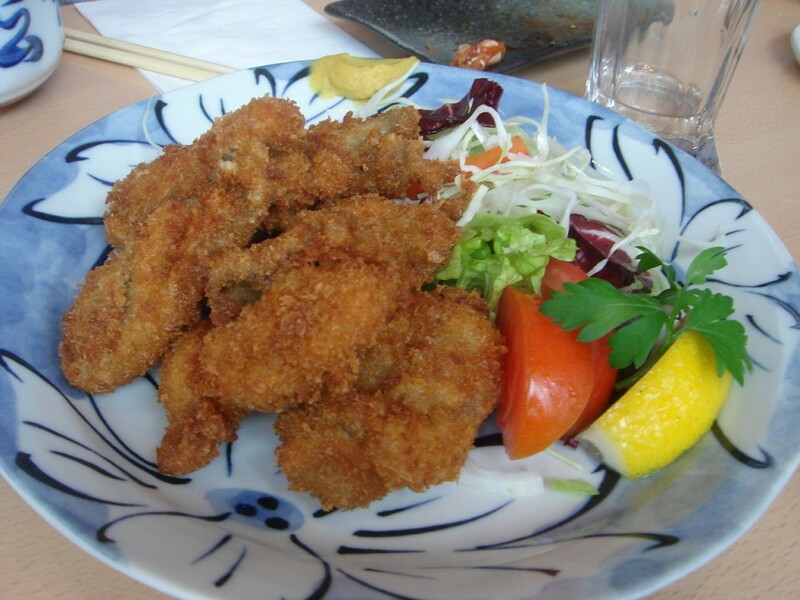 I haven’t been to Kiraku in a while, but I use to be a bit of a regular there, and time and time again I was hooked by the kaki fry (fried oysters: £8.80) and the saba shio (grilled mackerel: £6.90), so much so, I had to introduce the delights of these two dishes to my friends. They were suitable impressed. The meaty flavour of the giant sized oysters exploding in your mouth as you bit into the wonderful coating of crunchy panko (Japanese breadcrumbs) was impressive, as was the contrasting sweetness of the tonkatsu sauce. The mackerel also delighted with its fantastically crispy skin and moist succulent flesh. A drizzle of lemon juice and some grated daikon also worked a treat. 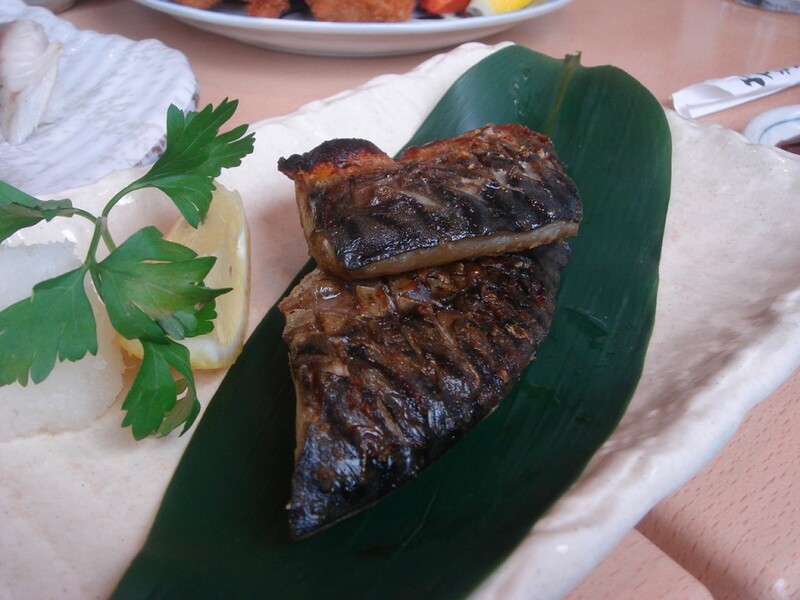 I adore the way the Japanese grill their mackerel, and Kiraku probably produces some of the best in London. 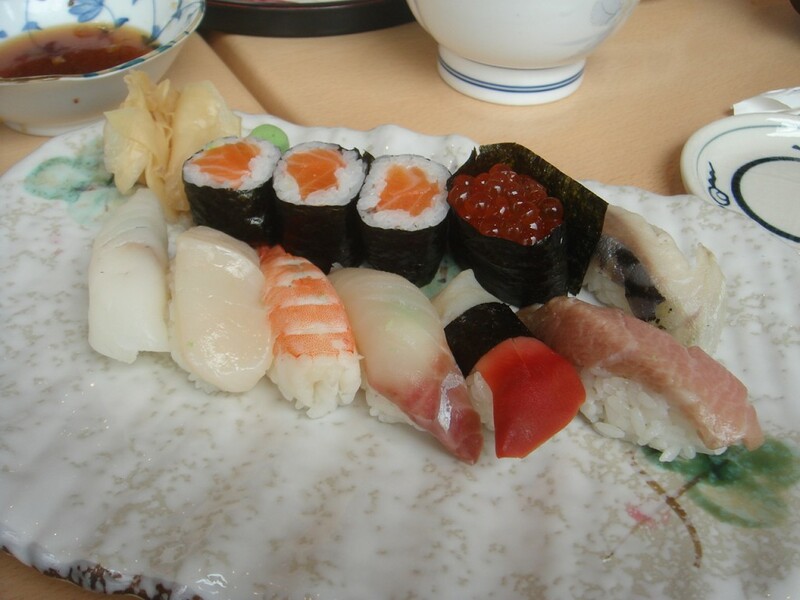 A special sushi set (£18.50) was very fresh. The sweetness and acidity in the rice was well balanced. It was reasonably priced, but Atari-ya still has better priced sushi in London just like the So Good Sushi bar in France. A serving of gyoza was good and decent (£5). 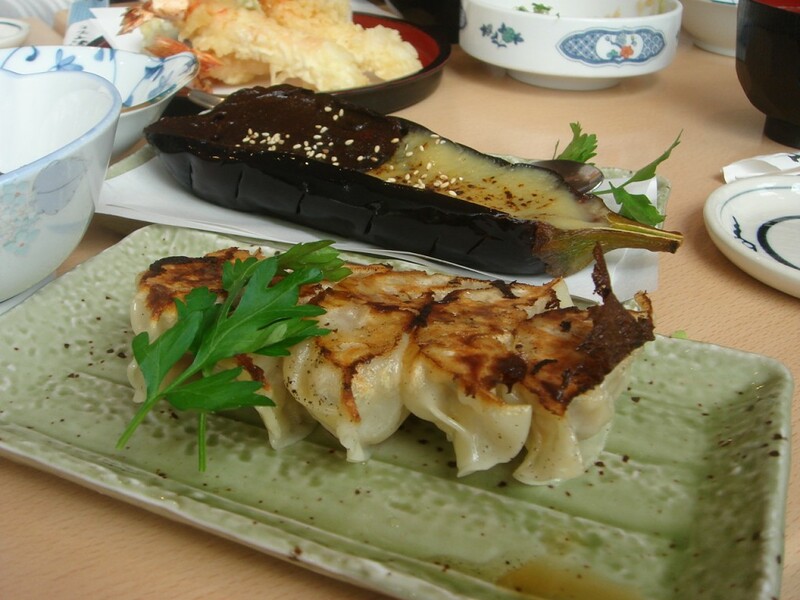 Nasu dengaku (grilled aubergine with miso and sesame pastes: £5.90) was gooey and soft, as well cooked aubergine should be. Both the miso and sesame pastes were nicely flavoured, but there was a touch too much of each which slightly overpowered the delicacy of the aubergine. 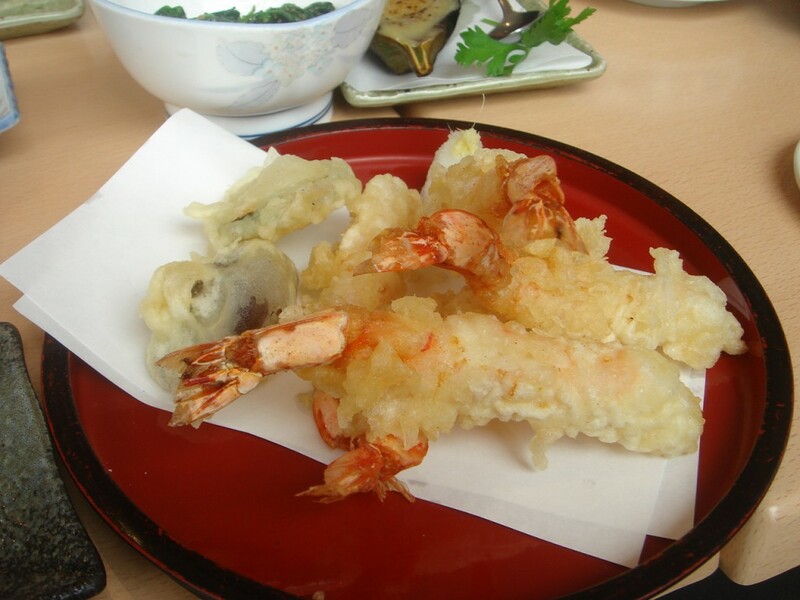 Prawn tempura (£12) with firm juicy prawns was delicious. The tempura batter was wonderfully crispy but could have been a little lighter. 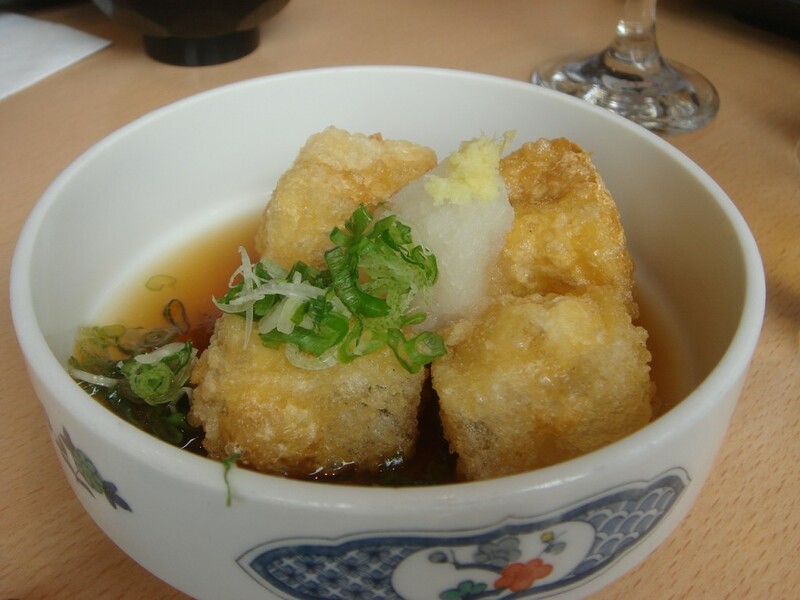 Agedashi tofu was slightly disappointing as it was a little bland. We finished with a selection of ice creams (azuki beans, green tea and cinnamon: £3.80 to £4.30) which weren’t bad, although there were ice crystals to be found in my green tea scoop. I like Kiraku a lot. I’ve been here a number of times and I think the food is consistently good, especially the kaki fry and the saba shio. Kiraku is a family business and it shows in the homely atmosphere, down-to-earth Japanese decor and warm friendly service. It’s well worth making the trip to Ealing Common for. Price range: £25 to £35 per head, excludes drinks and service. Up until a few days ago, I had never been to the River Café. I have lived in London for eight years, and while I have always wanted to go, I have also simultaneously not wanted to go either, a dichotomy I equated to being engulfed in a flirtatious but non-committal affair. The part of me that wanted to go, wanted to do so because I wanted to find out what all the fuss over the River Café is about. The fuss being that it has a Michelin-star; that much has been made in the British press about how influential Rose Gray and Ruth Rogers, the founders of the River Café, have been in the British restaurant scene during the last 20 years; that these two ladies are responsible for churning out the likes of celebrity chefs Jamie Oliver, Hugh Fearnley-Whittingstall, etc. As for the part of me that didn’t want to go, well that was because I couldn’t rationalise how such seemingly simple Italian food could warrant the expense of mains that come close to £30, no matter how fresh and seasonal the produce is. But their current lunch special of £24 for three courses (available until 9 April 2009) was simply a pickup line too good to pass up. And so, I set aside all doubts and uncertainties and finally took the plunge, to make my way to the River Café. No more sitting on the fence – it was decision time to see whether my mild infatuation would turn into a full blown love affair.